If you’ve ever been to the doctor, they probably pressed a stethoscope against your chest. Have you ever stopped to think about what is a stethoscope? An iPhone for your chest? At its most basic, In general a stethoscope is an acoustic listening device. Think of it like the microphone on your iPhone, except instead of letting you talk to friends and family, it amplifies the internal sounds of your body! Most stethoscopes have two sides at the head. The larger side is known as a “diaphragm”, while the small side is the “bell”. When the diaphragm is put on your chest, the sounds of your body shake the diaphragm, creating sound waves which move up the tube to the doctor or nurses’s ears. When the bell put on your chest, the tiny vibrations of your skin produce sound waves that move up to doctor or nurse’s ears. Before buying your first stethoscope, it’s important that you learn about the different parts that modern stethoscopes consist of. Knowing about the different stethoscope parts and features will help you to decide which model will best fit your needs and budget. 1 What is a Stethoscope? 3 What is a Stethoscope Used For? 4 How a Stethoscope Works? In medical terms – A stethoscope is a medical device that amplifies sounds so a person can closely listen to the sounds the heart, lungs, intestines and abdomen are making. Listening to these sounds can help nurses, EMTs, doctors, pediatricians, veterinarians, and cardiologists detect health problems such as problems with the development of the fetus, issues with blood flow, issues with blood pressure, and issues with respiration. There are acoustic stethoscopes and electrical stethoscopes. 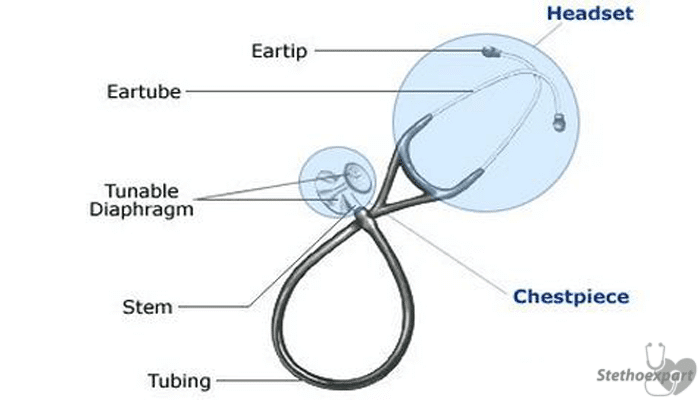 The headset is the part of the stethoscope consisting of two eartubes with eartips on them and the tension springs. It’s important that the angle of the eartips are match up correctly with your ear canals. 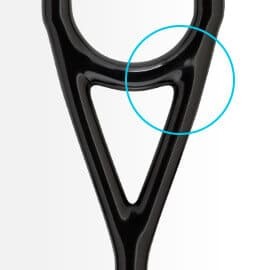 Most stethoscopes are angled correctly, but if you feel a little discomfort or can tell that the angle is not quite correct, then you can lightly bend the eartube to align it better. You can also adjust the tension of the headset by pulling apart the two eartubes or pushing them in until they cross over each other. The eartips are the soft part that slides over the ends of the eartubes. Eartips need to fit comfortably and snugly inside your ear canal to effectively block out as much outside sound as possible, and to make sue that you are getting the clearest and best acoustics possible when listening to the sounds of the heart or lungs. 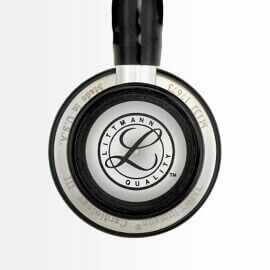 The Cardiology III Stethoscope by Littmann has exceptional eartips. They are called Snap-tight soft-sealing eartips and have a special surface treatment that keeps the dust and lint levels at a minimum, and increases the lubricity of the eartips when inserting them in the ear or taking them out. They really are designed for comfort and quality acoustics. The snap-tight ear pieces are available in small and large and in numerous different colors. The eartubes are the metal tubes that have eartips put on on one end, and are connected to the tubing at the other end. The purpose of the eartubes are to provide a stiff tube leading up to the ear. Traditionally, stethoscopes have a bell on one side of the chestpiece, and a diaphragm on the other side. The bell is used to hear the lower frequencies of sound and the diaphragm is used to hear the higher frequencies. Littmann stethoscopes come with what is called a tunable diaphragm, which means that you can hear the low and high frequencies, and switch between the bell and the diaphragm by simply adjusting the amount of pressure you have on the chestpiece. The stem is the metal tube part of the chestpiece where the tubing connects to it. On a tunable diaphragm, thee ability to switch sides of the chestpiece is in the stem. 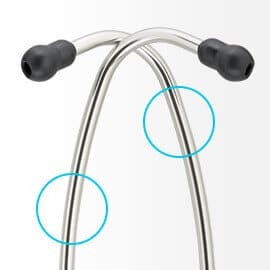 The tubing on a stethoscope is the soft tube that connects to the stem and the eartubes. Tubing is commonly made from PVC and is often 100% latex free in order to protect those who have a latex allergy. The chestpiece on a stethoscope is the part that rests on the part of the patient that you want to listen to. The chestpiece consists of the bell/diaphragm or tunable diaphragm, and the stem. Commonly on dual-sided chestpieces you’ll find a smaller chestpiece and a larger one. The smaller one is commonly used by pediatricians and on children, while the larger on is mostly used on adults. Rappaport and Sprague was the inventor of the two sided stethoscope that we’re all familiar with It was early in the 20th century. However, it wasn’t until invented of “stratified continuous lumen” and “kinetic acoustic mechanism” in the late 1990s that the truely modern stethoscope was born! Despite the scary looking names, these two inventions basically just increase the ‘volume’. This makes it easier for the doctor or nurse to hear what’s going on inside you! 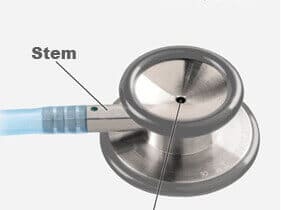 Typically, the traditional stethoscope has a resonator which is disc shaped and is put against the chest to listen to the sounds with two tubes connected to earpieces. Electronic stethoscopes work on the same principle as simple acoustic stethoscopes, the main difference is that electronic stethoscopes use a battery to amplify the sounds clearly. The electronic stethoscope is a recording device that can provide features such as visual as well as audio output, noise reduction and signal enhancement and as it transmits sounds electronically, it is wireless too. The sound level of the traditional stethoscope is very low and the electronic stethoscope uses advanced technology to overcome this issue by amplifying the body’s sounds electronically. The audio sound waves that enter the chest piece are converted to electronic waves that are then transferred through special circuits for optimal hearing. The circuit allows the sound waves to be digitized, encoded and then decoded, reduce or completely eliminate the ambient noise, and transmit them through headphones or speakers. 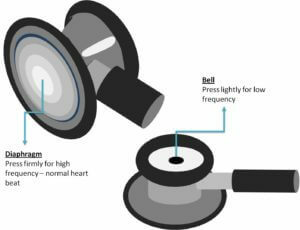 The various components of the electronic stethoscope allow the sound to be amplified and enhanced for listening at various frequencies. Electronic stethoscopes are further classified into two kinds: digitizing stethoscopes and amplifying stethoscopes. These convert audio signals to digital signals. 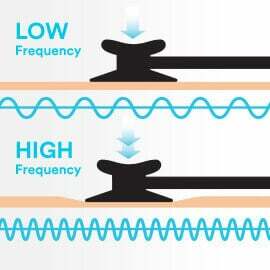 The sound that is gathered by the sensor, converts the sound to electricity that travels through the circuit. The sound is then amplified, filtered and converted from analog data to the digital form. Once digitized, the data can be transmitted via a videoconferencing unit or through computer software across a network. However, there must be a corresponding electronic stethoscope on the other side that will receive the data and convert the digital signal back to analog, amplify the sound, and transmit it to the human ear. Most of the stethoscopes that are available in the market today have an audio output signal that makes use of a stereo and mono cable connection. This allows the audio output received by stethoscope to be transferred real time to a software application that makes use of various algorithms to interpret and diagnose the audio output received. The audio output can be saved as a file and transferred through email for diagnosis and assessment. You also have the option of hooking up to a videoconferencing unit and transmitting the audio data real-time over a network. Some stethoscopes also have the option of transmitting data via a Bluetooth device. The electronic stethoscope has allowed medicine to progress by leaps and bounds facilitating giant steps in the field of diagnostics and has led to path breaking avenues for detailed study, research and evaluation and consultation of a patient’s medical condition, telemedicine and even remote diagnosis. The first stethoscope dates back over one hundred years. And while the design has changed several times the main uses of one has not. So, what is a stethoscope used for? The stethoscope is used by medical practitioners to listen to the heart, lungs and intestines in a human or animal body. In addition a stethoscope is sometimes used to take measurements of blood pressure. The diaphragm is placed against the patient’s skin in the area being listened to. When vibrations are picked up by the diaphragm the sound travels acoustically through the rubber tubing and is amplified by the earpieces. Trainee medical students will often learn how to use a stethoscope by practicing on themselves or each other in a class. Listening to the rhythm and sounds of a heartbeat is one of the many stethoscope uses. In healthy adults you will hear two sounds to a heartbeat called a ‘lub’ and a ‘dub’, as the heart contracts these sounds make the familiar ‘lub-dub’ heartbeat. When carrying out a medical examination on a patients heart the doctor will also be listening for any other sounds, such as murmurs, clicks or any irregular pattern. Move and place the stethoscope around the area of the heart to compare varying parts of the heart as it opens and contracts. 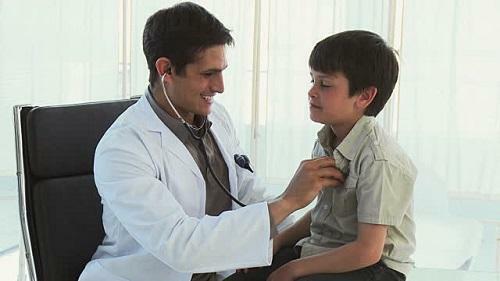 A stethoscope allows you to listen to the rhythm, speed and quality of someones breathing. If there are any obstructions or underlining problems to someones breathing these can be identified listening for any cracking or wheezing. Starting on the back, have the person you are listening to learn forward and place the stethoscope over the area where the right lung is.Listen to their breathing pattern here, then move across to the left, then the upper right, followed by the upper left. Basically, you are comparing is the person’s breathing sounds consistent across all four areas of both lungs. As your body digests food the intestines move and produce sounds that can be listened to with a stethoscope. The intestines are hollow and the sounds can echo through the abdomen making them easy to identify. 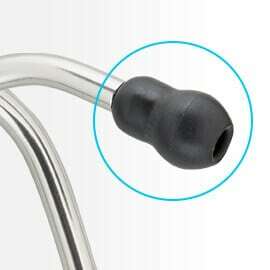 If you can not hear any sounds through the stethoscope this may indicate a health problem. There is a condition called ileus which is first noticed when a doctor is not able to pick up any sounds from the abdomen. Place the cuff around the arm, about an inch above the bend of the elbow. Put the earpieces of the stethoscope in your ears and place the bell (the opposite side to the diaphragm) on the brachial artery, found near the inside area of your elbow. Expand the cuff, this cuts off the blood flow into the brachial artery. Now loosen the value and let the air pressure start to decrease. 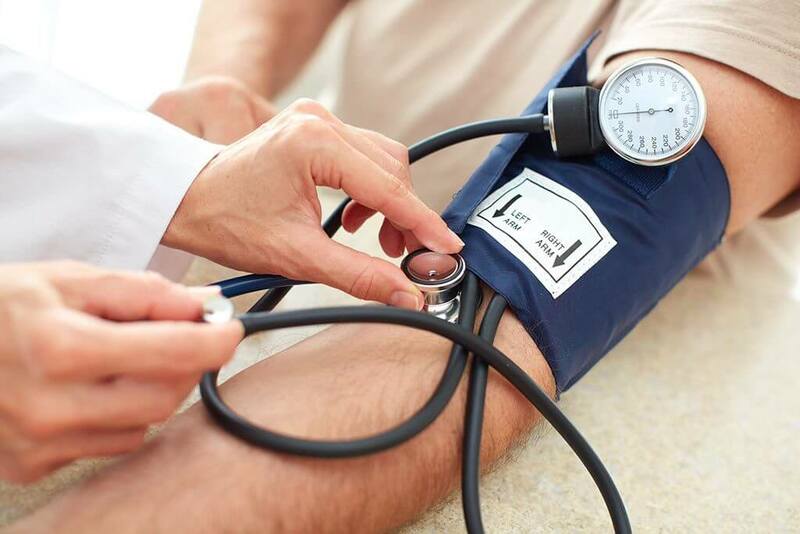 As the pressure falls the blood begins to flow into the artery again and the first sounds will be heard in the stethoscope, this is the systolic blood pressure(SBP). This article should have answered in detail what is a stethoscope used for?. It is important to remember that a stethoscope is an item of medical equipment. Therefore it should be cleaned regularly to minimise cross-contamination when used with multiple patients, and care should be taken not to damage it.